Whew. Long day. Long weekend! I started last week by running outside for the first time in forever and ended it with the Electric Run 5K (more on that tomorrow). Teaser: I think it went pretty well! I will tell you this about the Electric Run: I did it sans iPod because I was promised music throughout the course. This was not 100% delivered (I said more on that tomorrow) but I actually turned on some speed, probably thanks to my running companion Scott (I SAID MORE ON THAT TOMORROW). It did lead me to think that I should ask our readership - do we have a readership? Anyway, I'm asking you - how do you keep yourself rolling without music? Naturally, though, I prefer to run with music when I can. This week I went for a little Radiohead, with an emphasis on "Black Star" and "Electioneering." Fitter, happier, more productive! - SO MANY DISNEYLAND HALF POSTS I CAN'T EVEN. Expo! Meetup! Kids' races! 5K! 10K! Half! Dumbo! Live, Run, Grow! AllEars! Just Me and My Running Shoes! Half Crazy Mama! We Run Disney! Disney Every Day! Eat, Sleep, runDisney! Running at Disney! 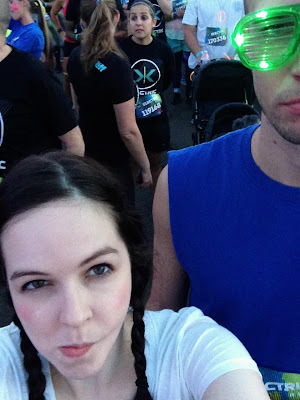 The runDisney blog! If I've missed a good one, please let me know - I probably missed it in the shuffle. Or it's possible I haven't even gotten to it yet; I STILL haven't slogged all the way through last week's Feedly! - Need to cleanse the palate? Here's a race that wasn't at Disneyland from Running for the Prize. - Feet Dominating Pavement shows you how to get better race photos of yourself. - Royal Runner talks costuming. - The Runner's Guide to WDW points out the importance of social media when running Disney. - After all that, I'd say we deserve a cookie. Over at A Pinch of Pixie Dust, Miss Emma is decorating her own at Boma! Thanks for the link love! I still haven't gotten through all of my feedly either...ahhhh!!!!! I know!! So much good stuff, so little time! I usually only go sans-music on shorter runs, and I don't miss the music too much as long as I have pretty scenery. If I'm having trouble getting going without music, I just sing to myself. Slightly embarrassing? Maybe. I'm ok with it, though. Thanks for the shout out! I think these Disneyland recaps have been some of my favorite to write, I managed to end up with so many good pictures!